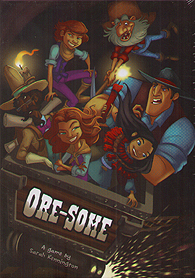 ORE-SOME is a frantic day in a Wild West mine played over 6 rounds. Guide your cart around a randomly generated mine filled with copper, silver and gold. Fill you carts with one and try and keep it there long enough to hand in your contracts. Your opponents have dynamite, oil cans, hidden springs, fool's gold, an adorable dog and more to try and get in your way, but then so do you, if you can find them!